Artist impression of the skate park. 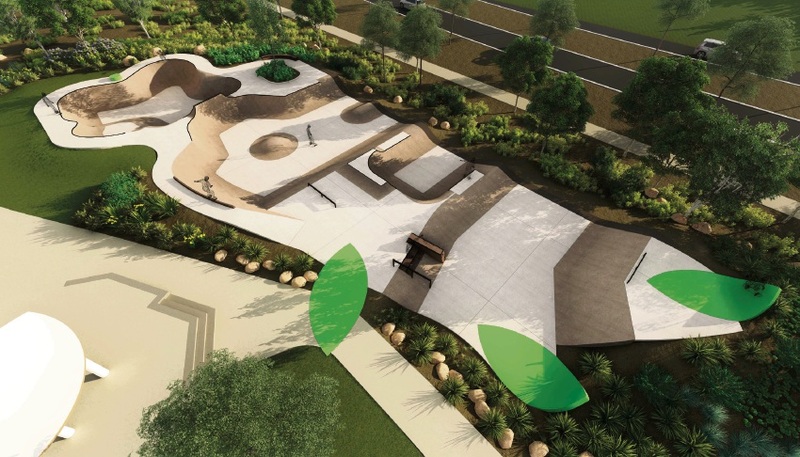 A SKATE park in Banksia Grove will be completed later this year with earthworks now complete on the $500,000 facility at the corner of Grandis Boulevard and Pinjar Road. Funded by the City of Wanneroo and the Banksia Grove Developers with the help of a Lotterywest grant, earthworks were completed late February with the park expected to be finished in July. The Banksia Grove Skate Park, endorsed by council in April 2017, was designed in consultation with the local community through workshops and feedback from Joseph Banks Secondary College students. Strategically placed close to public transport, schools and shops, the park was designed for people of all ages and abilities, the park provides skateboard, scooter and passive viewing areas. Wanneroo Mayor Tracey Roberts said construction would take about two months to complete with a further month for the surrounding soft and hard landscaping. “The skate park is expected to cost $506,000,” she said. “Of this, $200,000 will be funded by LotteryWest and the remaining $306,000 will be split evenly between the City of Wanneroo and Banksia Grove Development. The surfaces of the skate park will have an anti-graffiti coating so that any possible graffiti can be removed much easier.